The Hotel Vancouver is a quintessential example of the great Franco-Scottish chateau-style railway hotels. These types of hotels had been built by the national railway companies in nearly every major city across Canada since the late nineteenth century. They represent a uniquely Canadian architectural style derived from Canada’s multifaceted cultural roots. The Hotel Vancouver was started by the Canadian National Railway and completed in 1939 with a joint operating agreement with the Canadian Pacific Railway. Construction had begun in 1929 but was left unfinished during the Great Depression. However it was rushed to completion in 1939 for the visit of King George VI. This 17-story iconic structure was designed by architects Archibald and Schofield. This was the third hotel to be named Hotel Vancouver. The first building was a 5-story brick farmhouse-like structure built by the CPR in 1887. The second was completed in 1916 stylized in the manner of an Italian villa that later became a government administration building during World War II. Despite public opposition it was demolished in 1949. 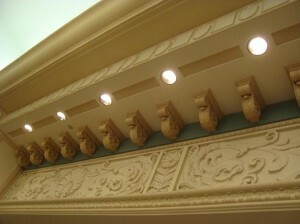 The third and current Hotel Vancouver is characterized by a moody medieval gothic romanticism of gables and gargoyles tempered by bas-relief illustrations of locomotives, ocean liners, Hermes the Greek guardian, head-dressed First Nations chiefs, heraldic tableaux and a clan of carved chimera. The eccentric decor inside contains Art Deco motifs, a Corinthian columned stairway, and a Rococo ballroom. It is royally capped by the patina copper roof. The Hotel Vancouver was one of the last buildings in BC to be ornamented with stone carvings. Most of these carvings were done by European stone carvers who traveled the country looking for work during the depression years. Some of the granite blocks weighed one to eight tons each and would take about a dozen carvers a year to finish. The Hotel Vancouver remains one of the city’s most beautiful landmarks. 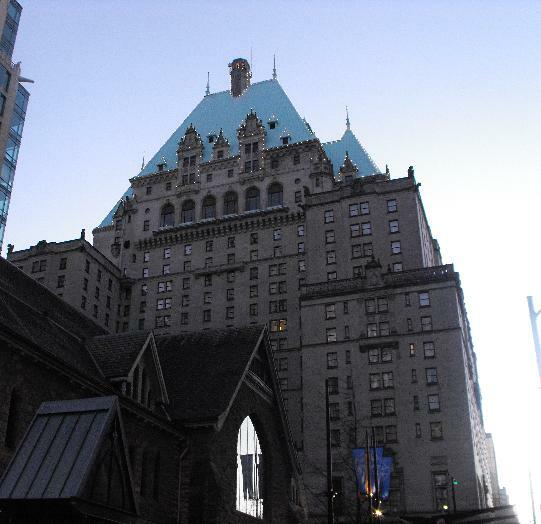 It is currently named the Fairmont Hotel Vancouver and owned by the Fairmont chain of hotels and resorts.